A reader just shared something interesting with me. Remember all the hullabaloo about the 2014-2015 Blood Moon Tetrad? You know, the one that made national headlines and all that? It culminated with a "Supermoon" lunar eclipse on September 28, 2015 - the Feast of Tabernacles. That was the fourth and final blood moon in the Tetrad. From the September 28th blood moon to the Revelation 12 Sign on September 23, 2017 is exactly 726 days. See here for confirmation. Unfortunately, dear readers, I'll have to hold you in suspense regarding the significance of this. I'm not going to finish the story, but you can by heading over to Google and doing a quick search for "Strong's 726". If you make an account with the forum, you can direct message him. Neither is demon or trinity. Ignore at your own peril. How about imminence is imminence in the bible? The current religious leaders sure jump to that term whenever the topic of 9/23/17 comes up. Reminds me of another bunch, what were their names? Oh yeah, Pharisees. the word Bible isn't in the Bible either - does that mean the Bible doesn't exist? And no offense intended, but while you're at it you should check out getting a better argument, too. The old "the word 'rapture' isn't in the Bible" line is arguably the weakest one of them all. Just for fun: Apply the same argument to the word "Trinity" and see where that leaves you. The Bible was not written originally in English - Hebrew for Old Testament and Greek for New Testament. In Greek the word is "Harpazo" and so the Rapture is in the Bible, 14 times in the Greek. It even appears in the Revelation 12 sign. Get Pastor Bob's study: "The Season of the Rapture: God's Three-Fold Witness". It contains his academic study (70+ pages) proving the Rapture is in the Bible. He gives it away FREE and shows how God has foretold the end in a most astonishing way. Pastor Bob's address is EvanTeachr@aol.com. "...in the twinkling of an eye, at the last trump: for the trumpet shall sound and the dead shall be raised..." 1 For 15:52 There are 7 Trumpets; the 5th (Rev 9:11) 1st Woe! lasts 5 months (150 days); the 6th Trumpet 2nd Woe! lasts 13 months, 1 day, 1 Hour. The 7th comes immediately after the 6th on the last day before the 2nd Coming. Why not read the Bible rather than Study Notes? ayyyy. I think Tony is well versed in what shalom means Howard. Do we rebuke Christ and Pauls words to his disciples and church when he said 'peace' to them, e.g. 1 Cor 1:3. We forget that everything good and pure and righteous from God will have its counterfeit. Do we rebuke churches when they sing psalms to Jesus, since ACDC sings songs as well??? Im sorry Howard - but I hope you don't mind a gentle rebuke. Don't accuse Tony of having a lack of understanding of something that God declares in his word - when Tony may actually have a greater understanding of what 'peace' is than yourself. You are still a young believer, and I suggest you listen to others on this forum who are trying to provide some guidance in your walk, rather than 'casting stones'. Oh yea baby..we are outta here! julie, julie, julie! what a jewel you are!! i love the way you said that!!! Wow! This very old TV show comes to mind as we move into September! Come Lord Jesus quickly come! Nice job connecting the dots! Be careful Daniel; YHWH is the ineffable Name used in Rabbinical and Masonic circles for Saturn, symbolized by the Six Pointed Star of Saturn on the flag of Israel and in the Masonic Square and Compass; this is not God. Alpha, I AM, JEHOVAH (Ex 6:3KJV), JAH (Ps 68:4KJV), JEHOVAH (Mat 1:25KJV), Melchisedek, Shiloh and Omega are all Names of God. Yo Howard...good op to read Exodus 3:2 and then look at the likes of bible hub.com to see what the transliteration is for the name of the Lord there. If someone else wants to use the name of the Lord for unfortunate purposes, thats their problem...it doesn't stop us from addressing him using the names he gave us in hebrew, greek, aramaic etc. I am not blessed by you. A word of affirmation and encouragement is not to be found. The fruit of the spirit has not been seen. Your comments don't reflect any of them. An acknowledgement of the lateness of the hour and the need to be diligent and urgent in our encounters with others has not been heard. The point of this blog is and has always been to encourage others be ready, although many seem more interested in debating greek words, interpretations, the date and hour and who the AC may turn out to be. It seems you are very concerned about many things. It seems most everything posted by everyone, gives you pause and concern. Wondering what your concern really is? We are not justified before Him by our intellect or perfect understanding, especially of sections of scripture that are clearly debatable and difficult. No one here ever said we were 100% confident of any comment on the prophetic. We do regularly offer things that may be prophetic or world events that are aligning towards a future fulfillment. We also say, there is a very strong indication that the prophecies are lining up firmly, rapidly and intently and people should be ready and help others be ready. We may be wrong on whole bunch of things, but we're not wrong on everything. He is sending warnings. He expects us to see them and we do. Wonder if people spend as much time debating as they did sharing their faith, what would happen to this world? This is not an academic exercise. He is coming. We don't study the scriptures to find life. We study to find Him and in this case we find that He is coming soon. That's the point. The whole point. All of our prophetic insight may be old news in the coming weeks. I would encourage everyone to put more effort into things that last. What will last is those who were far off and have been brought near, by the work of the bride and the love, joy, peace, patience.... that we show each other. Praying for you and that we might be united in Christ - John 17. Just add it to the already huge list of reasons why I truly believe the rapture will happen this September. There's just far too many signs God is giving us from every angle. We go home this September. wow, that is nuts, right out of revelation! and singing a song about this is the end. This suggests that Strong's Concordance might be divinely inspired, because it was the only moving part in this. Maybe not divinely inspired like the Bible, but God is in control and puts all the parts in place. I'm sure He also knew that we would greatly enjoy all of this. Our God is amazing. I am more in awe of Him with each of these little discoveries. And the verse just prior to Revelation 12 speaks about the ark of the covenant. Uhhhhh...wow! There are no coincidences. 33 days from the eclipse to 9/23. Strong's 33 is "Come!" One more thought....33 is a number associated with promise. Google the biblical significance...there are several examples. Could God be telling us through the great American eclipse that 33 days later he will fulfill his promise to "keep us from the time of testing that will come upon the whole world" by calling us to "Come up here!"? I guess we'll find out soon enough. An omniscient God would obviously be aware that we would find/are finding these connections and "coincidences," and He would have known from eternity past how James Strong would construct his concordance and what number he would assign to harpazo. It's not necessary to suppose Strong had any idea about this, much less that he was "inspired." He did alphabetize the Greek (and Hebrew) words in assigning numbers, and these words were inspired. Without Strong, we might never have considered that harpazo is #726 in the alphabetical sequence. God must have anticipated the very order of the letters in the Greek (and Hebrew) alphabet itself. Did He match the letters and the words to the courses of the moon and stars at the time He created them? What a thought. No wonder His words will never pass away. The Word bible is not in the Bible! What's your point? Is it just a sign that something is coming soon, what makes you so convinced it will happen in that week, and not later in 2018? Ohmygosh - I just looked it up in my Greek-Hebrew Study Bible and IT'S TRUE!!!!!!!!!! This is by far the most AMAZING sign confirming the Rev 12 Sept 23 date. I am BESIDE MYSELF!!!!!!! WOW!!!!! To all you doubters I say that if this Rev. 12 Sept. 23 date is not about the Rapture, whether on any time between the 21 to the 23rd, then, then the rapture is never going to happen - if this Feast of Trumpets in 2017 is not the time, then it is never going to be the time. God does not lie. His Great Name is at stake. He will do what the Sign says it is - the catching away of the saints. You can "take it to the bank". Period. ......notice that in the New Testament, concerning the birth of Christ, the Bible calls the men who followed the Star "wise men". Put on your "big boy pants", believe His Great Sign, and take a stand for Christ. Be wise and follow the Star now pointing to the Final Victory of the Holy Spirit - the culmination of the Glorious Church of Jesus Christ being caught up into Heaven, and stop being a sissy about something we sing about and clap about, but can't believe it's actually going to happen on or about Sept. 23. Have the faith of Abraham, your Father. "Now faith is the STUBSTANCE of things HOPED FOR, the EVIDENCE of things NOT SEEN..."
"Wise Men" follow Stars; Strong's #G3097 "Magos", Oriental Scientist, Magician, Sorcerer"; H#7227 "Rab-Mag", Chief Magician. Pharisees look for signs. Jews demand a sign and Greek search for wisdom (1 Cor 1:22) Careful Barbiosheep and Carol; the Word of God is fine the way its written. Resurrection occurs at the "Last Trumpet" 1 For 15:52; 1 Thess 4:17; the 7th Trumpet is the last, occurring on the last day before the 2nd Coming; the 2 Witnesses having been killed in Jerusalem by Satan will rise moments ahead of those who accept Jesus and His Word written the way He wrote it. Here's a "shocker" or you: The "two witnesses", as stated in Revelation, are the "two candlesticks and the two olive trees". The Bible always interprets the meaning of its symbolism somewhere else in the Bible (there are always matching scriptures in He Word explaining these symbols if you have an ear to listen to the Holy Spirit). The Word of God says early on in Revelation that the candlesticks are churches and that we, as believers in Christ, are the wild olive tree who has been grafted onto the natural olive tree. Therefore, the "two witnesses"is a symbolic name representing all the redeemed of the Lord- Old and New Testament believers, who are the witnesses of the Lord down through the ages, and at an appointed time, God shall declare "that there is time no more", they will "have finished their testimony", and shall be caught up to Heaven (the Rapture) So much about the Book of Revelation is wrongly interpreted by people who do not have a revelation as to what God means, substituting their thinking instead of what God means. The Book of Revelation clearly states in the beginning and the end, that it is written "to the churches" and no one else. Howard, you are being legalistic about the Word of a God, not balancing literal and symbolic meanings, which requires enlightenment by the Holy Spirit, who leads us into all truth. Humbleness, not strict dogmatism, applies in so many passages. The Holy Spirit is our teacher and unless you have a Revelation as to what exactly God means in future events that have not occurred yet, sometimes God surprises us with the opposite of what our mind makes up concerning His meaning- and that applies also to all the end-time prophecy teachers who just say what has been said by others in the past and they teach it as if it was dogma, repeating the same wrong interpretation down through the ages. Ask God in humble prayer, willing to hear only what He gives you as the true meaning of a future event or symbolism, putting away anything any teacher says in a book, and He will reveal it to you. And guess what else - the 144,00 is also a symbolic number for all the redeemed, as the next scripture following that scripture explains it as being a great multitude of all nations, kindred and people standing before the throne. These two witnesses are not two Jewish prophets as many have taught, but simply a representative number of lol the redeemed. Many have added to the word of God when trying to interpret Rev. and missed the simplicity which is in Christ. To add to your response....Revelation was written sometime after Thessalonians (70+ years I believe). The trumpet judgements had not been revealed at the time Paul wrote Thessalonians, so they could not be the same...IMO. Greetings to all. I have not posted here before, so please bear with me. I feel a little like those people who were praying earnestly for Peter when he was in prison, and when the word came by Rhoda to them they could not believe it and told the girl she was out of her mind and had seen his ghost. Like the disciples who for joy could not believe their Christ had risen indeed. Like Thomas, for whom it was well and good that others said the Lord had risen, but he needed to see with his own two eyes because he dared not hope in a risen savior without the proof of his own senses. I sympathize so deeply with that man, with those people. I am nearly too weak for faith, and too weak for hope, and I must see it. I long for it. That God might grant it, according to his wisdom and goodness toward us, or that in his providence he might tarry while the time is not yet right. But oh, to see it... That I might say with Job that my Redeemer lives, and that one day he will stand upon the earth and my eyes will see it, my own and not another's. I have watched this, I think almost since it became a thing. About the tail end of when the tetrads were a thing. Then came my exposure to the idea of the Shemitahs--I began to feel that something was up. Israel had been a nation for some time, I knew. I knew that it would only be a generation from that point. Which span of time easily encompasses my brief span of years. And the funny thing is, I was not raised dispensational. Not at all. This is all enough to make a body change her stripes, as it is all straight out of the pages of our book, and I will take that over whatever flavor another believer subscribes to. Then came the unfolding of the knowledge about this amazing sign. I am beside myself with suspense and awe and wondering, I am laid prostrate before the God whose hands I see weaving this together. I am also terrified out of my mind, though whether it is mindless, naked dread, or the fear of the Lord becoming to saints I cannot tell. I am comforted that this is the natural response of those who find themselves in the presence of the Most High... I have seen his decree playing out before my eyes, and that is near enough his immediate presence to warrant that response. I feel almost that I have seen his back, and I cannot get my face to the ground quickly enough. My prayer for myself and for us all is that we would be granted strength to comprehend, with all the saints, what is the length and the breadth, and the height, and the depth of his love for us. And that for those of us who feel as though the foundations are shaking out from beneath us, that we should be granted simply to trust in the one who began this work in us, and will be faithful to complete it. The holy men of old looked and longed for these days, these ends of the ages which have come upon us. These all died in faith, having welcomed the promise from afar. And the Lord has been pleased to bring the likes of us to see with our own eyes the fulfillment of all that he has promised. Look! The zeal of the Lord of Hosts is accomplishing it! And here I sit with my hand over my mouth, and I cannot muster another blessed word. Powerful and sobering words. Come Lord Jesus! "that we should be granted simply to trust in the one who began this work in us, and will be faithful to complete it." This is my daily prayer with tears. Your words move me deeply and my spirit echoes yes & holy holy holy. First commment on this site. It is a blessing and so full of the wisdom and love from our Lords great works and holy book. @afterdarkness, your words just shook me to my core! I could not put into words what I have been feeling in the last couple of months and I am sure I am not the only one who can relate to what you are describing! I fell away from faith for so long. Held to anger, self loathing, depression and resentment for far to much time. And then literally one day recently in the last few months, like a rope tied around my waste, He said come back. Please come back. I will tell you some of my story on my return back to Jesus Christ our Savior. My eyes have been opened to what I have been blinded to but felt for so many years. I have felt for a while now that the world is changing and rapidly. The sin, violence, hates, rapes, anger have accelerated at a rapid pace. My bible sat on the same book shelf for almost a decade! I was suicicidal not even 4 months ago from bad experiences and my walk of life. I prayed for peace and healing as I felt what little self control I had slipping through the cracks. The Lord God almighty answered my prayers and removed all of my inner torment from my soul. He healed my mind and opened my eyes to His love and mighty power! I was saved as a teenager, but became consumed in my lifes struggles with family and mental health. I am a completly different person from 4 months ago. I believe he is calling us home! I spend every reee moment I have now seeking His word and wisdom, praying and worshipping him and trying my best to understand his messages and wisdom. If you listen, pray and believe, he is showing us something profound. I found the information about the sign coming this fall and every bone in my body wants to tell everyone, He is coming. Can' t you feel it? I would love to hear your story. This year, the last few months, have brought incredible gracious restoration for me as well. God is so faithful....I lose my words so many times simply because I don't have language for his grace and goodness! Yes bloodredmoon. Impending event is felt from the momement I wake and even keeps me up at night. Not in a anxious or worry way, but out of excitement. And impatience lol. I really think falling away and ignoring and pushing away this sense and the Lords quiet calling, greatly contributed to my depression. But He quit being quiet and yanked me back with that rope around my waist! I am adhd and sometimes things need to be pretty obvious for me to get it. He was loud and clear! I want to believe Jesus, The Lord of Lords and King of Kings, is coming back soon, but I am afraid to get my hopes up only to have nothing happen this fall. I know I need to live for Christ either way, however my flesh has me entrapped with the world. Please Jehovah give me and my fellow believers strength. Wait, it gets BETTER. There are always TWO days on the Earth at any given time. While digging in to Strongs, check the one before, Stongs 725 & the verse ascribed to it. Oh yeahhhhhh . . . I have always been fascinated with the end times and this site is super amazing. Part of me has always wanted to be left behind so someone could explain to my family/friends what happened. There is no such thing as being "Left Behind" because there is no Rapture of the Church. The Resurrection of the Church happens on the final day before God's Wrath on the Desolate. 1 Cor 15:52 and 1 Thess 4:16 use the terms "Last Trumpet"; the 7th and last Trumpet is on the final day before the 2nd Coming, not at the beginning of the fictional 7 Yr Tribulation. Don't be fooled people. Amen Anonymous! This site and forum is like my second church. I hope to see you in the clouds! Howard, if you don't have anything kind or productive to say, don't say anything at all. have you mentioned your site to anyone here howard?,...yet! Not only does it mean "Come!" it also means it imperatively, as in. "Come! Come now!" Not only does it mean "Come!" it also means it imperatively, as in. "Come! Come now!"" THIS is incredible. Thank you for sharing!! Gary pulls my comments that are straight out of Scripture. This site is dangerous. Read the Bible BRM Care to put your knowledge of Scripture up to the test let me know. 7 Yr Tribulation, Pre-Tribulation Rapture, 7 Yr Dispensation of Israel are Lies. Titus 1:13 "Rebuke them sharply" come to mind? Jesus rained down Polemics on lying Pharisees. This is what true Christians are obliged to do. Hello Blood Red Moon - regarding your comment about "fire proceeded out of their mouth", I just wanted to answer by saying that that "fire" is a veiled reference to Jeremiah 23:29, which says "Is not my word like as a fire? saith the Lord and like a hammer that breaketh the rock in pieces? ", and another harmonizing scripture is Isaiah 49:2 "And he hath made my mouth like a sharp sword...", which believers, with the word of God in their mouth, both Old and New Testament, have, down through the ages, used the word of God as a victorious weapon against their enemies. The "power to shut Heaven, that it rain not in the days of their testimony" (again, believers down through the ages) is again, a veiled reference to them walking in "the Spirit of Elijah", which believers have been doing "in the days of their prophecy (their particular days on earth), and " power over waters.....all plagues (the word of God in the mouth and heart of believers can curse, bind and loose, and do amazing miracles when coupled with faith) like-minded with the spirit of Moses, etc. Someday soon, according to Rev. 12, we (believers down through the ages), with the sword of God in our mouth, will have finished our testimony. Jesus said at the Cross: "It is finished". Soon, we too will say "our testimony is finished.....I have run the race, I have fought the good fight of faith...."
That's a real shame... you were a great contributor to the forum. I do hope you reconsider. However, if you truly believe God is telling you to leave, then go in peace. Maranatha! ***Howard***, I'm going to respectfully ask that you not post on Unsealed anymore. I've consistently seen you throw accusations, label others, call people "liars", boast about how you're right and others are wrong, etc. Even still we've let you post many things. I've deleted specific comments from you that were particularly hateful or hurtful/invalidating to other Believers, but yet you continue on after admonishment and sowing much discord. People have been able to freely post here for years and I've rarely if ever deleted comments (except for solicitors). I don't think you're right with the LORD - and I don't mean regarding salvation (I don't know your heart, I can only see your fruit) - I just mean in regards to how you treat and respect other Believers who disagree with you. You have yet to demonstrate to any of us humility or brotherly love, which should be key indicators of God's children. I honestly mean it when I say I'm going to pray for your physical and spiritual wellbeing and for growth in your relationship with the LORD and other Believers. I truly wish you the very best and please forgive me if I haven't honored Christ in anything I've said to you. ***Blood Red Moon***, your comments have been consistently encouraging and insightful to me. I hope and pray you will reconsider. I'm on your side of this and you have my support, but I also love and support you and wish you the best as well. Just wanted to end with: "Ye are my witnesses, saith the Lord, and my servant whom I have chosen..." (Isaiah 43:10) and Isaiah 44:8 "Don't don't be afraid. Haven't I proclaimed from ages past that I would save you? You are my witnesses - is their any other God? ", and many more other scriptures explaining what God means in Rev,11 as his "two witnesses". In other words, the number "two" can stand for many more than exactly two. For instance, if I were to say that there are two stores I like to shop in- Wal-Mart and Target, the number "two" would actually stand for many more that strictly "two". Thank you for reading my post. Maranatha anyway. And you're not coming off as harsh. God bless. 1] The Feast of Trumpets (the Lord's New Yer) ends on 9/23 when the Rev 12 sign arises in Israel over Jerusalem at sundown (God's timing is awesome! Can't see it here in the US because of sunlight, so visible to Israel). What I have not read here is that during the Feast of Trumpets (beginning or end of the two day celebration I am not sure), the Jews will sound/blow the shofar (i.e. trumpet) 100 times. If I may suggest, it is NOT the 7 trumpet judgments of Revelation, BUT it is the last trump from the shofar at the end of the 100 blows during the Feast of Trumpets!!!! This is the beginning of the Lord's New Year, the Jewish/Hebrew year 5778! So take ALL Bible verses relating to the last trump and I believe it points to the Feast of Trumpets. Jesus has fulfilled the first four Spring Feasts, He has yet to fulfill the ones on the fall (Trumpets (Rosh Hasananah or Yom Teruah), Atonement (Yom Kippur), and Tabernacles (Sukkot). I feel strongly the Feast of Trumpets 2017 (70yr anniversary of the state of Israel) is divinely special for ALL reasons mentioned in this post and the many other nice articles on this site and the many good youtube videos out there today. 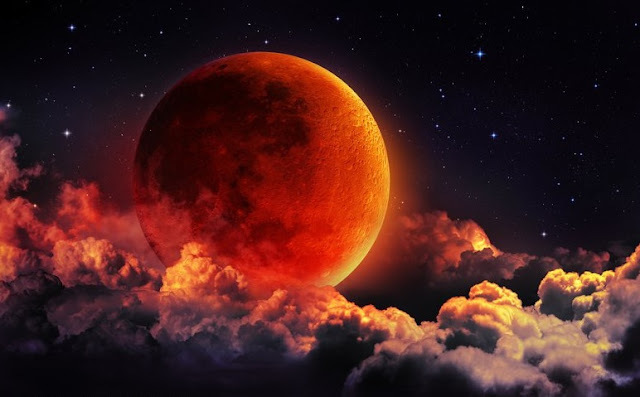 3] I am currently doing a small group at my church on the Signs and Wonders Above, and it perhaps does not shock me that other Christians are just blowing off the upcoming eclipse or the Blood Moon Tetrads as nothing prophetic. Tomorrow I am showing/ presenting on the Rev 12 sign and praying to have a large group (more than 3) show, but the Church is asleep and just doesn't care and doesn't know. There is a ton of prophetic events happening but the Church is asleep! The heavens contain God's signposts and warnings and has been, continues to reveal Himself through cosmic/ astronomical wonders. Pray for open eyes, open ears, and an open spirit for others to learn of this upcoming great sign! from partial solar eclipse october 24th, 2015 (the solar eclipse between the blood moons) up to the Feast of Trumpets (sept 21st, 2017) is 1064 and strongs greek 1064 is gaster or "womb of a woman with child" - this is the same word used in Revelation 12:2 she being with "child" = gaster = that is a child in her womb - God is good!